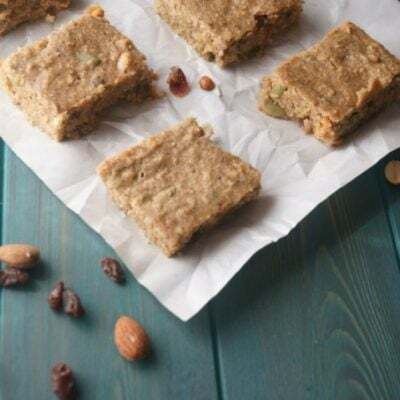 Gluten Free, Dairy Free Snack Bars filled with nuts and dried fruit. In a food processor, blend together the oats, baking powder, almond milk, bananas, eggs, peanut butter, maple syrup, vanilla, chia seeds, and flax seeds together until batter is smooth. Stir in raisins, cranberries, almonds, and sunflower seeds. Spread in baking dish and bake for 20-25 minutes or until set.